The Photography Workshop is being held on the 10th April at the Scottish Arts Club, 24 Rutland Square, Edinburgh EH1 2BW. 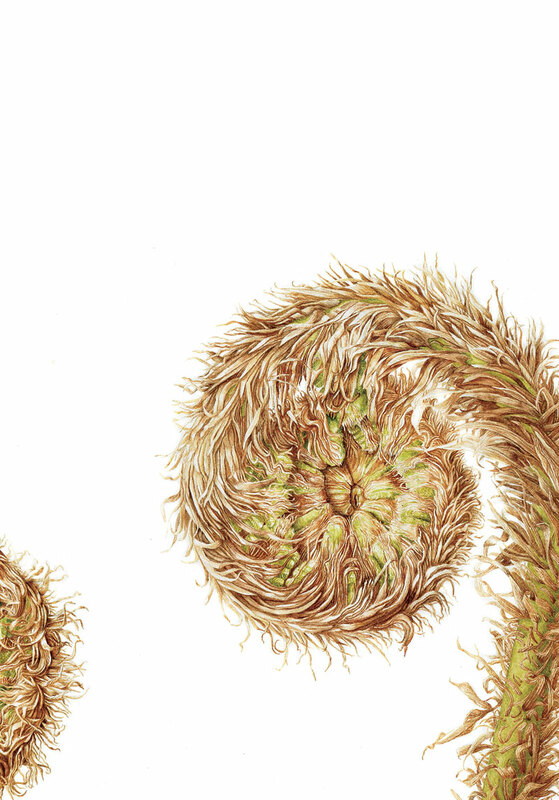 Alistair Cowan who is a member of the Royal Photographic Society, is leading this workshop, and the programme, specifically designed for Botanical Artists, is set out below. 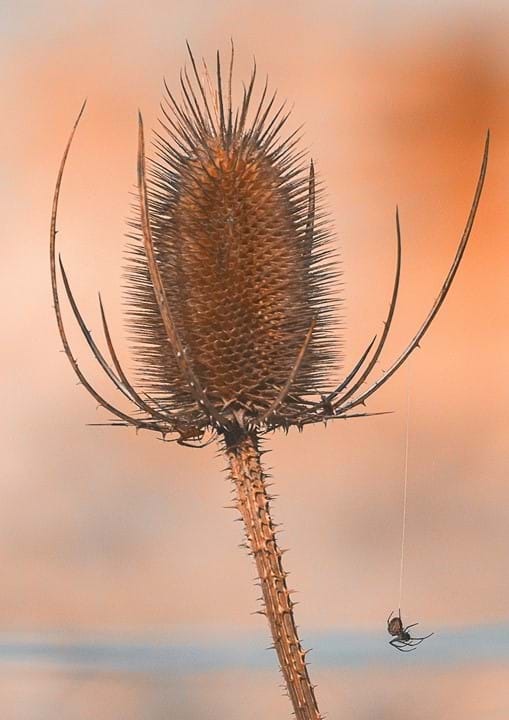 Alistair won the RBGE prize for best Plant Portrait in the 2018 photography competition. The fee for the workshop, that includes morning coffee and a two course lunch, is £50, with the day starting at 10.30 and finishing at 4.40pm. The SAC has a very good restaurant, offering a varied daily menu including a vegetarian option. Please bring with you whatever you normally use to photograph your art specimen: e.g. Camera and tripod if you have one, or your iPad, or other tablet, or phone. Also please bring a flower exhibit and vase, if needed, and an example of your completed artwork, or something in progress. We are delighted to share that Marianne has two pieces in the current Visual Arts Scotland open exhibition ALIGHT 2019 at the Royal Scottish Academy Edinburgh. 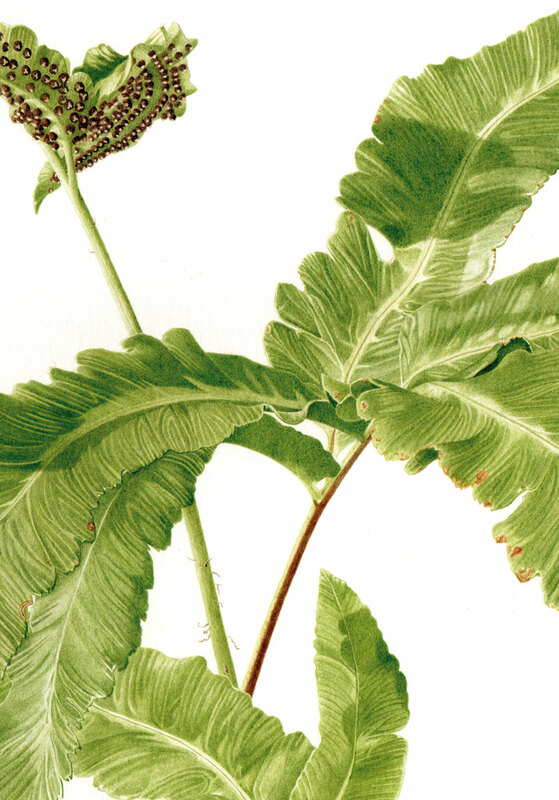 The two pieces are new ink Arisaema, continuing her series of ink shoots. 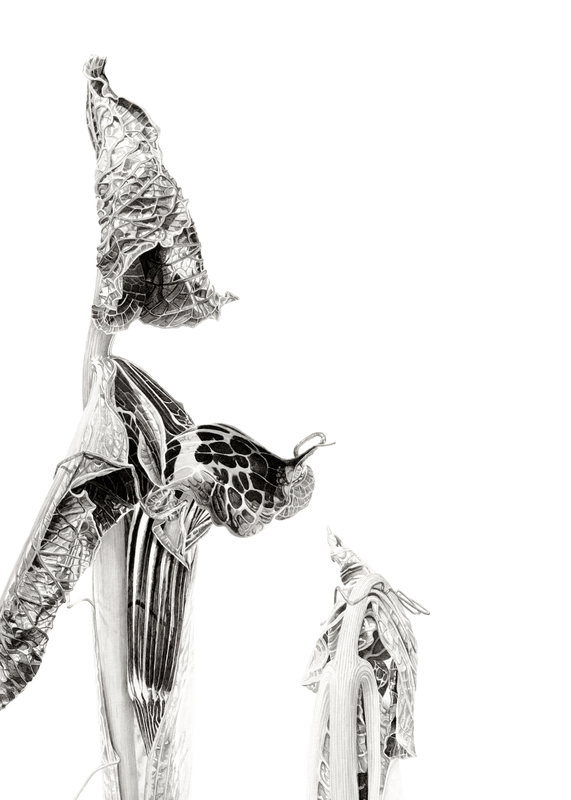 Marianne has been awarded the Open Eye Gallery award, which is a Solo exhibition in their gallery in the future. 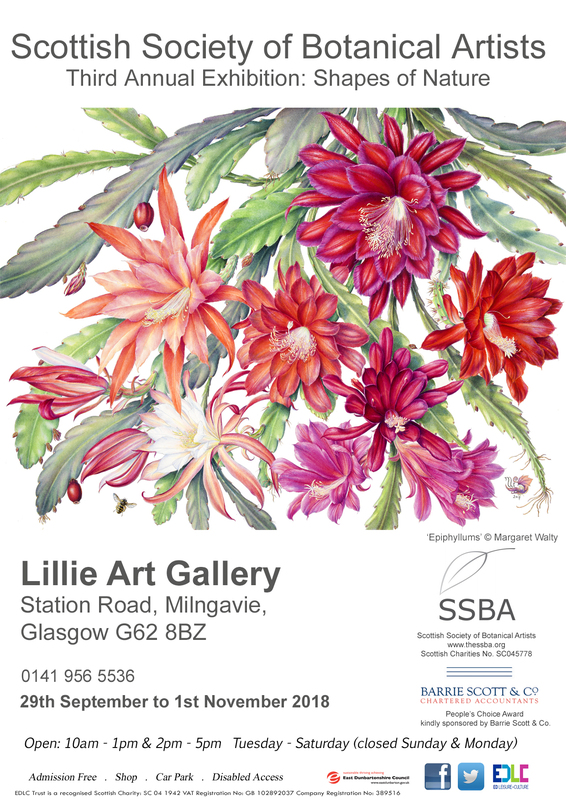 The exhibition features a variety of paintings, drawings and print work alongside artists working in wood in association with Craft Scotland and jewellery makers and silversmiths working in innovative, ethical and sustainable practises. 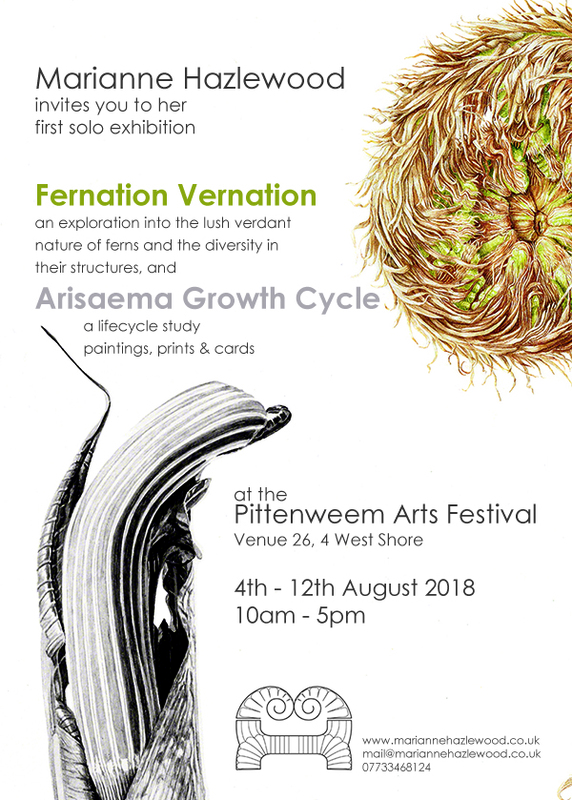 We are delighted to share that Marianne has had two of her fern paintings accepted for this prestigious exhibition. The exhibition comprises painting, printmaking, sculpture, installation, video and performance art featuring established and new artists based in Scotland and internationally. 23 Dec 2018 – 17 Jan 2019. Margaret Walty demonstrating her acrylic techniques, honed over 30 years of professional practice. Margaret’s demonstration piece, showing how she uses glazes to build up rich, complex tones. 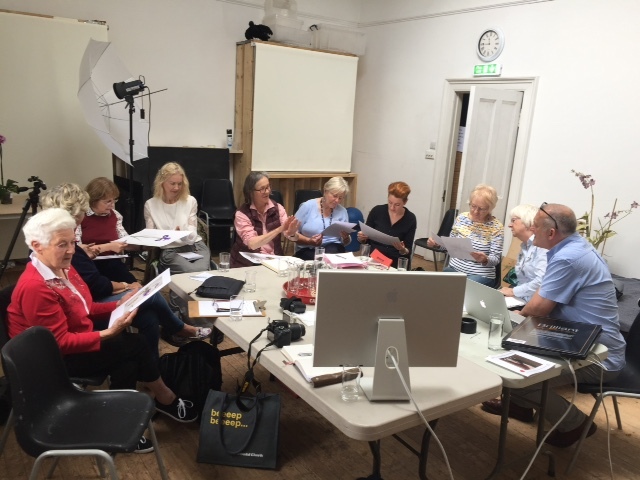 A small group of enthusiastic painters got together at the weekend for an SSBA-organised acrylics workshop at Queen Margaret University with award winning artist member Margaret Walty as our tutor. 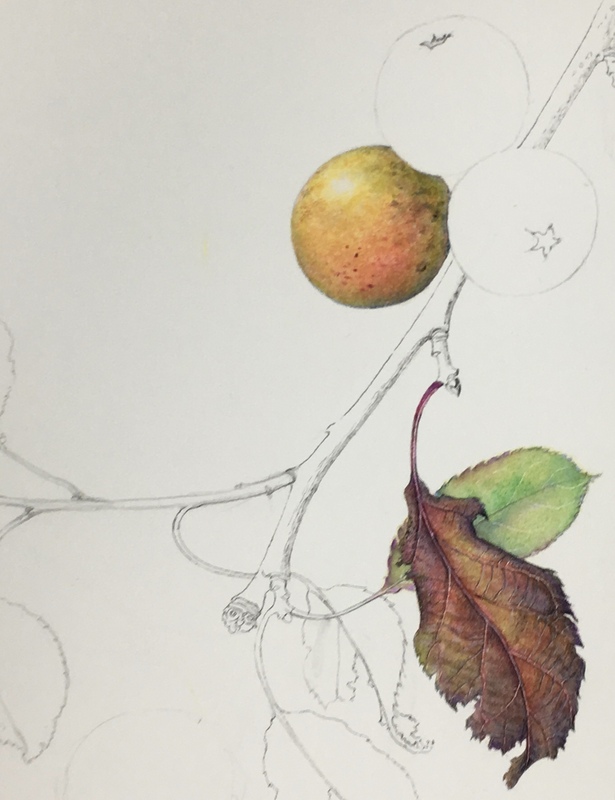 Member Bill Philips has just started a new blog, which will focus on botanical art and related matters – check it out at wdphillipsart.blogspot.com. As well as originals, there is a wide range of cards and prints available. 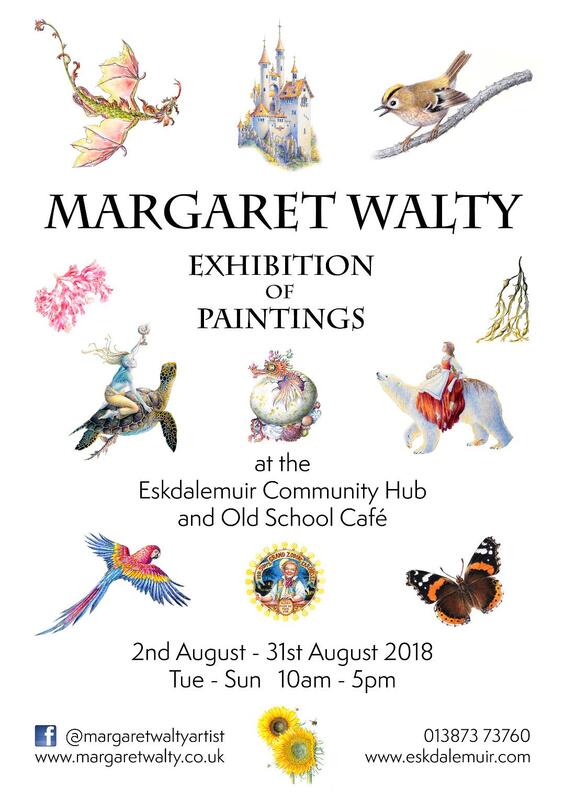 Member Margaret Walty will be exhibiting at the Eskdalemuir Community Hub and Old School Cafe from the 2nd to the 31st August. A big thank you to Eric from all of us who attended the talk. It was a great morning with lots of positive feedback. Eric was very informative and professional and gave very helpful hints and tips for the amateur photographer in us all and has kindly agreed to a full days workshop next April. You can now support the SSBA every time you shop at Amazon, using our Amazon Smile affiliation – just click the logo below and shop as normal. Copyright of artwork remains with the original artist. Copying, saving, reposting, republishing of artwork prohibited without express permission of the artist.